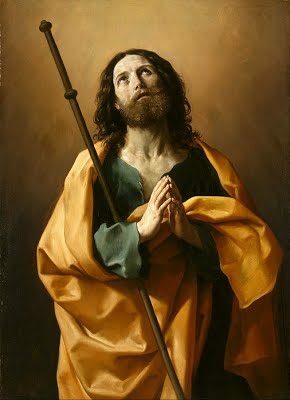 July 25 - Saint James, Apostle - Feast - My Catholic Life! The primary legacy of the Twelve Apostles is silence. Yes, their voices are sometimes heard in the Gospels, but briefly. Yes, they traveled, evangelized, and built up the Church, yet discreetly. And yes, they were martyred, save John, but obliquely. Who went exactly where, and did what, is guesswork. When, how, by whom, and where each Apostle died is largely conjecture. Even most of their burial places are uncertain. After the Resurrection and Ascension of Christ, and especially after the martyrdom of Saint Stephen, the Apostles dispersed throughout the deserts and mountains of the eastern Mediterranean world. They gave their backs to Jerusalem. And as they walked away, their trails were lost, sand covered their tracks, and history’s endless cycles erased their memories. With some few exceptions, all the valuable details were forgotten. The Apostles are now twelve islands of names in a sea of silence. Some footprints of today’s saint, James the Greater, were preserved by Scripture. James was a member of the Twelve and of the Three. Peter, James, and John were the inner core that formed a shield of fidelity encircling Jesus Christ. James and his brother, John the Evangelist, author of the fourth Gospel, were fishermen who were called from their job on a lake to become fishers of men. It’s possible that other men were called before and after them, but that these men laughed in Christ’s face, thought Him crazy, asked a thousand questions first, or just refused to follow a man they did not know. Those who said “No” to Christ are unknown. Christ’s was not an open invitation. He was on a mission and kept walking. There was a moment, and then the moment passed. James and John seized their Christ-moment with both hands and never let go of it. A moment became forever. Peter, James, and John were in the home of Jairus when his servant was raised from the dead. On Mount Tabor they gazed in awe at the illumined face of Christ, his person radiating like the sun. And these three were at Christ’s side in the intense stillness of a Thursday evening in the garden of Gethsemane, providing what consolation their presence could. In the Gospels, Saint James is impetuous and full of character. Everyone likes vanilla ice cream. Saint James was not like vanilla ice cream. He wanted Christ to rain fire on the Samaritans for their obduracy. He even desired to be seated at Christ’s right hand in the kingdom of God, which led the Lord to prophesy his fidelity unto death. Saint James’ shocking martyrdom was dutifully recorded by the early church. Saint Luke’s Acts of the Apostles states that “King Herod laid violent hands upon some who belonged to the church. He had James, the brother of John, killed with the sword” (Acts 12:1-2). No other Apostle’s martyrdom is recorded in the New Testament. Perhaps he was singled out by Herod because of his fiery temperament. He would not have been one to retract a statement. He and his brother, after all, earned the nickname the “Sons of Thunder” from Christ himself (Mk 3:17). And so it was that James probably knelt, his neck resting on a block of wood as his head extended past it. And then the sword fell, the blood ran, and the first crown of martyrdom rested on a head without a body. Saint Ignatius of Antioch, in a letter to the Church at Ephesus in about 110 A.D., wrote “The more I see a bishop keeping silent, the greater should be the reverence I have for him.” A vast forest of green plants grows and makes not a sound. One Apostle is martyred and it seems to make just a slight ripple upon the pond. But the forest still grows, and has been growing for two thousand years. The Church continues, and will continue. Thousands of miles from Jerusalem, and two thousand years after his death, the mysterious silence of this Apostle, as that of all the Apostles, echoes. Every time a baby is baptized, a Mass is said, and a priest walks through the door of a hospital room to anoint a dying man, the mission of Christ carries on. Saint James, you died a shocking and unjust death. May your courageous witness to Christ at the end of your life, and your impetuous generosity toward Him during your life, make all Catholics bold and forthright in their love of the things of God. AMONG the twelve, three were chosen as the familiar companions of our blessed Lord, and of these James was one. He alone, with Peter and John, was admitted to the house of Jairus when the dead maiden was raised to life. They alone were taken up to the high mountain apart, and saw the face of Jesus shining as the sun, and His garments white as snow; and these three alone witnessed the fearful agony in Gethsemane. What was it that won James a place among the favorite three? Faith, burning, impetuous, and outspoken, but which needed. purifying before the “Son of Thunder” could proclaim the gospel of peace. It was James who demanded fire from heaven to consume the inhospitable Samaritans, and who sought the place of honor by Christ in His Kingdom. Yet Our Lord, in rebuking his presumption, prophesied his faithfulness to death. When St. James was brought before King Herod Agrippa, his fearless confession of Jesus crucified so moved the public prosecutor that he declared himself a Christian on the spot. Accused and accuser were hurried off together to execution, and on the road the latter begged pardon of the Saint. The apostle had long since forgiven him, but hesitated for a moment whether publicly to accept as a brother one still unbaptized. God quickly recalled to him the Church’s faith, that the blood of martyrdom supplies for every sacrament, and, falling on his companion’s neck, he embraced him, with the words, “Peace be with thee!” Together then they knelt for the sword, and together received the crown. Reflection.—We must all desire a place in the kingdom of our Father; but can we drink the chalice which He holds out to each? Possumus, we must say with SL. James—”We can”—but only in the strength of Him Who has drunk it first for us.